Finding Dory Premiere Experience with Ellen, Sand and More! Along with Ellen, I have been anxiously waiting the Finding Nemo sequel, Finding Dory, for years. Thirteen years later and it’s finally here! I was finally Finding Dory on the red carpet… well, blue carpet that is! My Finding Dory premiere experience was one I will never forget. Being able to attend the Finding Dory world premiere was absolutely amazing! As we make our way to the El Capitan Theatre, home of the Finding Dory world premiere, we stop for a photo opp on the Oscar stairs. It’s a tradition for the bloggers attending premieres at the El Capitan. As we walk along the Hollywood Walk of Fame the crowd is unbelievable. Of course, there’s the usual costumed characters and street performers. Before we enter the blue carpet we receive our tickets. I always hold on to my tickets as they are something I will forever cherish. Entering the blue carpet is a rush. Security is telling you to move along but you try to take your time for pictures and to get a view of the celebrities. All of us bloggers have a buddy so we can take pictures of one another. I also posted FB live and periscope (@giveawaybandit) videos as we moved along so I could share our experience with all of you. Be sure you check those out! Fans surround the carpet anxiously awaiting even a glimpse of their favorite celebrity. Cars pull up to drop off celebrities as police K-9’s check each vehicle. Who doesn’t want to see an adorable dog in booties checking vehicles? The crowd goes wild as each celebrity makes their way down the blue carpet filled with press taking interviews and paparazzi trying to get that perfect photo. Tears filled my eyes as Ellen and Portia made their way on the carpet. Scandal star, Portia, stunned in an Antonio Berardi black and white color-block gown from the pre-fall 2016 collection while Ellen kept it more low key as her usual self in trousers. Both ladies accessorized with sunglasses. The celebrities had major sun in their eyes when doing interviews. They both looked fantastic! I loved watching the cute couple move down the carpet holding hands. I caught a glimpse of Portia brushing the hair from Ellen’s forehead. They are such an amazing couple and an inspiration to so many! As everyone made their way to the entrance of the El Capitan it was finally time to watch Finding Dory! Of course, first we had to check our phones at security. They do not want anyone snapping pictures or taking video of the movie since it doesn’t hit theaters until June 17th. I grabbed a drink and a cute Finding Dory themed bucket of popcorn. After we find our seats we are treated with the live organ player making it a memorable movie-going experience. Before Finding Dory starts, we are treated with Piper, an animated short. I’ll reveal the details on this amazing short soon! At last, Finding Dory has started. I had my expectations extremely high for this movie and every single expectation was met and then some. It was absolutely amazing! Once again, Pixar does not disappoint! It fills you with emotions and laughter. Just keep swimming is the theme for Finding Dory. We’ll watch Dory as she just keeps swimming to find her family. Of course, Dory tries hard to remember. You’ll swim along with Dory, Nemo and Marlin as they make new friends and finds friends from when Dory was just a baby. There are so many important messages in Finding Dory. The one that stood out most to me is finding the importance in the meaning of family. Being able to watch it with the cast and filmmakers is an amazing experience. There’s laughter and clapping throughout the movie. Be sure you watch through all the credits. There’s a huge moment at the end that had everyone rolling in their seats. As everyone makes their way out of the theater, fans are snapping photos with celebrities. I was moments away from getting a selfie with Ellen but security moved her along. She had a huge crowd around her. 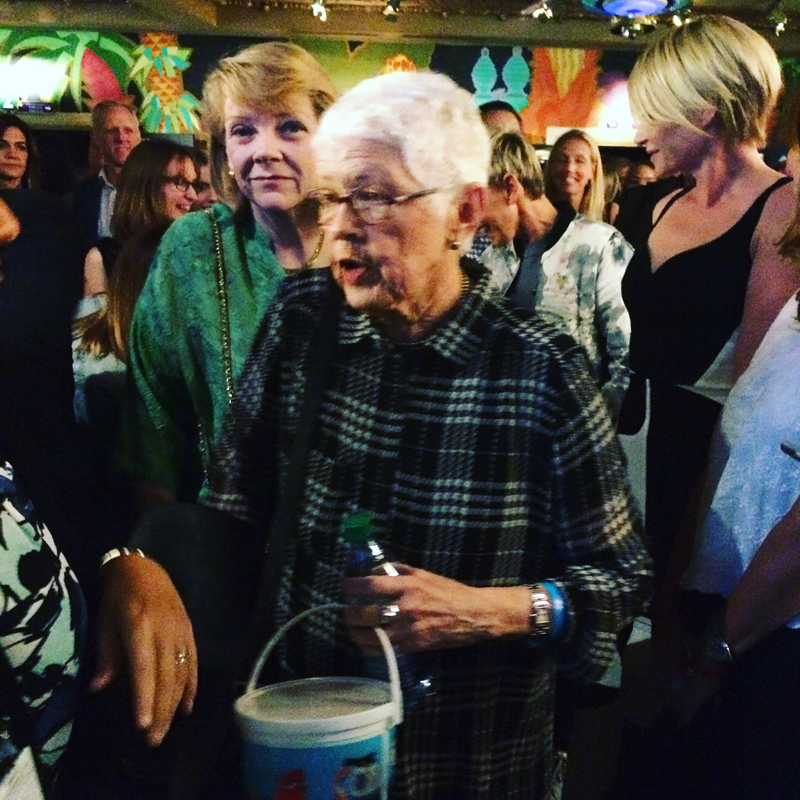 Of course, no Ellen experience is complete without her mom, Betty DeGeneres. I captured a cute photo of her with her bucket of popcorn. After each premiere guests are able to enjoy the after party. Many celebrities bring their children and families so they can enjoy the movie and fun afterwards. This premiere definitely kept children in mind with a mobile aquarium, sand and face painting! They even had a live band to enjoy! The sand was amazing with someone re-creating the Finding Dory theme image in sand! Food was served buffet style at different locations throughout the party. Drinks for any age was available. Kids and adults both enjoyed the Finding Dory themed Juicy Juice boxes. Adults could enjoy wine, beer and a variety of other beverages. They offered The Keaton wine created by Diane Keaton, voice of Dory’s mom Jenny in the movie. Of course, no premiere is complete without Billy Bob Thornton. Talk about an amazing photo opp that I didn’t see coming! My friend Melissa (sippycupmom.com) and I got a great photo with Billy Bob and Jeff Garlin (The Goldbergs). I really wanted to ask Jeff if he’d remove his pants but I chickened out! Both men were there enjoying the premiere with their families. I also got a pic with Modern Family’s Rico Rodriguez. And the cast of Bizaardvark. Finding Dory world premiere with the cast of Disney Channel’s Bizaardvark. (l to r) Jessica (themomcreative.com), Melissa (sippycupmom.com), Ethan Wacker, Madison Hu, Olivia Rodrigo, DeVore Ledridge and me. I have a great post about this amazing new Disney Channel show coming soon! Finding Dory is a must see! I can’t wait to take my family to see it when it hits theaters June 17th! It is perfect for the whole family to enjoy! 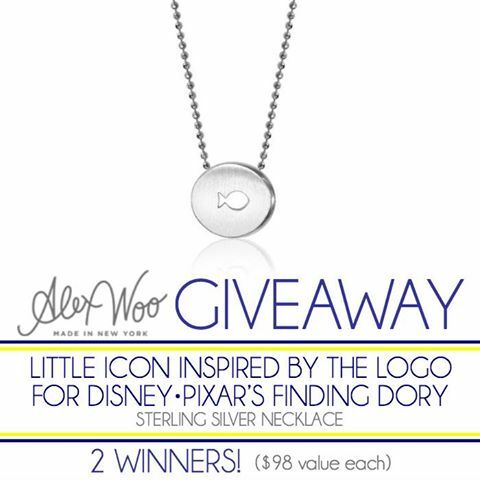 We are giving away two Little Icon necklaces inspired by the logo for Disney Pixar’s Finding Dory! These sterling silver necklaces are made in New York by Alex Woo. $98 value each. Giveaway is open to the US only, ages 18 and older. Giveaway ends June 27, 2016 at 11:59 pm EST. Enter to win via the giveaway form below and good luck! The giveaway is open to residents of the US only, ages 18 and up. It will end on 6/27/16 at 11:59 PM EST. One winner will be randomly selected using the Giveaway Tools random selector and notified via email. Once notified, the winner will have 48 hours to respond or a new winner will be chosen. This giveaway is in no way associated with Facebook, Twitter, Instagram, Pinterest or Google. Void where prohibited. Will you be taking your family to see Finding Dory this weekend? Comment below and share with us!